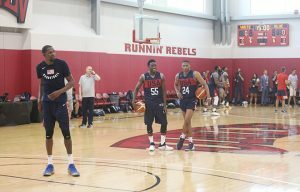 Anytime you put the best players in the NBA together for a two day mini-camp, there is always jokes, guys playing around, but when it comes to basketball USA Basketball Head Coach Gregg Popovich knows what it takes to put together a winning team. Today’s Day 1 one of mini camp was without Lebron James, Stef Curry or DeMarcus Cousins and Kyrie Irving served up some passes in street clothes and a custom pair of Jordan 4 PE Oregon kicks and Kevin Love just watched off to the side, but others seem eager to work on one of the best teams for the upcoming Olympic Games. So some people are asking why even have this camp if there is no game to play? No international competition on the radar for this year? Well that is a great question, but some of it can be explained, only some of it. This year was the normal rotation to have the World Championships staged, as the last one was held in 2014, in Spain. But the event has been rebranded as the World Cup of Basketball, and in an effort to give it more attention, it was pushed back a year so it wouldn’t be on the same four-year rotation as the soccer World Cup. The next World Cup of Basketball will be played in China from Aug. 31 to Sept. 15, 2019. Is this just a way to look at players that potentially are on the bubble to make the roster for this 2019 team? Who knows, but there are players getting some good work in the off season in and certainly playing a similar to an All Star game style workout. Another thing of note from this camp is the number of players missing from the workouts. Another big name, Kahwi Leonard, who was traded from the Spurs last week for DeRozan. Leonard will use the time to prepare to transition to the Raptors. Other notables, John Wall checked in looking stacked after all of his off season workouts and his desire to make the Wizards a much better this upcoming season. Many of the players took notice as well and commented on his bulking up and working on his shot.